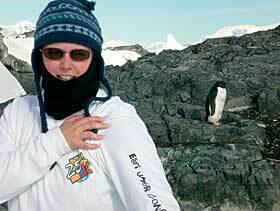 Suzann M. Leininger, owner, ECOMap Cartographic Services, San Diego, California, is pictured in Antarctica, at Detaille Island (an abandoned research station), below the Antarctic Circle at 66�52'2.01" S 66�47'25.82" W. The bird behind her is an Ad�lie penguin. 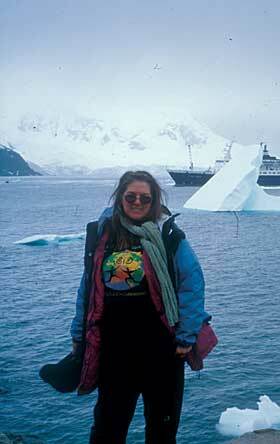 Gotta love folks who take their Esri T-shirts to Antarctica! Jenny Rechel, a geographer/wildlife biologist researcher with the U.S. Department of Agriculture (USDA) Forest Service in Riverside, California, journeyed to the southern hemisphere and also happened to stop in Antarctica. She traveled (along with her Esri T-shirt!) on the 104-meter Russian vessel, the M/V Orlova, that is pictured in the background. 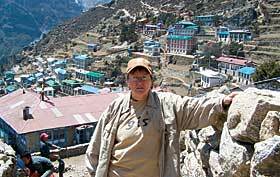 Debbie Allen, GIS manager, City of San Antonio, Texas, trekked to the Everest Base Camp in Nepal. This photo was taken at Namche Bazaar, elevation 3,440 meters. She says, "It was a pretty rough journey, but to see Mount Everest in person was worth it!" Nice T-shirt, too! Waza National Park in Cameroon. 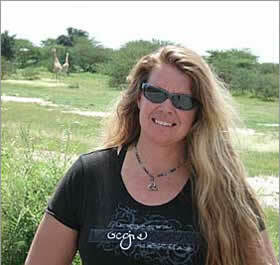 Michelle was in Africa to lead GIS training and conservation workshops for Earthwatch Institute scientists. Taku is an Earthwatch Scientist studying the etho-ecology and conservation of the grey-necked picathartes bird, indigenous to the Central African equatorial rain forest region. 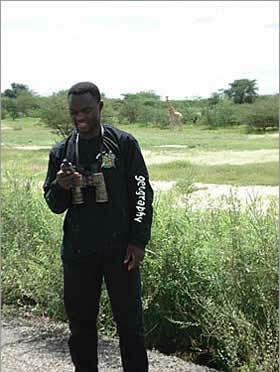 He is pictured here recording the location of a group of foraging giraffes. And, of course, they both made a point to wear their Esri T-shirts while in Africa! 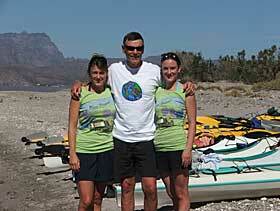 Mike Miller, supervisor, Mapping and Data Department, Public Works Engineering, Eugene, Oregon, and his two daughters, Sunny and Lacey, went on a one-week sea kayaking excursion to the islands east of Loreto, Baja, Mexico. 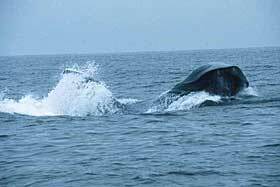 While paddling one day, they crossed paths with the pictured blue whalewhich was pretty impressive! His Esri T-shirt proved to be the cherry on top of a perfect day. Wear an Esri T-shirt in a unique location and send a photograph to ArcNews. Photos will be considered for use in ArcNews, the expanded T-shirt section at ArcNews Online, or both. While digital photos sent via e-mail (tmiller@esri.com) are preferred, prints or slides can be sent to Thomas K. Miller, ArcNews Editor, ArcNews T-Shirt Feature, Esri, 380 New York Street, Redlands, California 92373-8100 USA.